Swimwear is considered a specialized product category and not manufactured by many in India or Bangladesh. However, with the popularity of sports and games increasing in India over the last decade, more and more youngsters are going for various aquatic sports, particularly swimming. This growing awareness and exposure is creating demand for quality swimwear, and market for the same is growing globally. Manufacturing swimwear is mastering two aspects: use of speciality fabrics and cutting and sewing of swimwear. In this article we detail the making of basic swimwear which is a lucrative expansion for manufacturers producing T-shirts with very little upgradation of machinery. With product diversification being the next growth engine for Indian apparel manufacturers, StitchWorld looks at not-so-common product categories which can easily be made with addition of few new machines, while a majority of the machines remain the same. There are basically two categories of swimwear which are manufactured in garment industry: one is performance based swimwear, and the other is leisure swimwear. Leisure wear are made to be worn on beaches and swimming pools while performance based swimwear is worn by swimming professionals. In leisure wear, testing fabric for colour fastness, chlorine and sea water is key requirement while in performance based swimwear resistance to snag and fading with exact fit are taken into consideration. Although leisure swimwear is easy and more like beachwear to manufacture, most manufacturers don’t make it due to fear of investing in varied specialized machinery. As of today, most performance based swimwears are being manufactured in China, Vietnam and Sri Lanka for big brands like Reebok, Adidas and Speedo. LINEA AQUA, Lobster, Lycot, Attiva and Jockey are the Indian companies manufacturing swimwear for both the domestic and international market, exporting majorly to Middle East countries like Dubai, Kuwait as well as Spain, UK and Australia. Team StitchWorld spoke to Abhay Chapia, Owner of Attiva regarding the fabric requirements of swimwear. Attiva makes available top quality Italian fabrics from Carvico to the Indian markets and also has a range of yogawear and sportswear apparels for the Indian domestic market with its own apparel manufacturing facility. 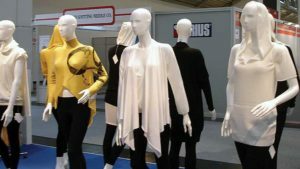 A lot of fabrics for the category is coming from Italy, as these fabrics are very specialized and contain a minimum of 18-22% of lycra or elastane content, while the balance could be either polyester, nylon or polyamide. In Europe, shape-retention swimwear that gives a leaner look to the wearer has been developed containing 29-30% elastane. There are three basic fabrics used worldwide for producing swimwear: the first fabric is made of 20% elastane and 80% nylon; the second is a cheaper variant with 20% elastane and 80% polyester; and the third variant has 53% polybutylene terephthalate (PBT) and 47% polyester which has high chlorine resistance of 270 hours as against 160 hours in other blends. The only variation in swimwear fabric is the one used for making beach shorts, which are made of woven polyamide or polyester fabric. Fabric quality inspection for swimwear is same as for other knitted fabrics. However, since the conditions under which it is used is different from other knit items because of the extra stretch property, certain allowance is given prior to dyeing and printing of the fabric. The most crucial stage in the entire production process of swimwear is the spreading and cutting stage, because the fabric has a lot of stretchability; and if not properly handled, results in high shrinkage and fabric slippage due to high polyamide content. For spreading large volumes, manual spreading table can be used to reduce stretchability, otherwise an alternate method is to relax the fabric for certain duration on the cutting table. Laying height of not more than 4 inches is preferred for spreading this fabric, with maximum of 30-40 plies, otherwise the bottom plies will not be able to shrink properly, as the top part relaxes more while the bottom part will not be able to relax. For resolving the same, sheets of perforated underlay paper is placed between each ply which increases the ply slippage and hence the relaxation percentage of the bottom plies. For spreading smaller volumes, it’s better to lay not more than 20 panels at a time with layer height of up to 2 inches, because beyond that the fabric below starts shrinking due to high elasticity and during cutting the lower layers do not have enough pressure to lie in place. Use of pin tables is also popular for cutting smaller layers and that too manually using band knives to give precise shape and curves. Two parameters which are very important while sewing a swimwear are its length and the shape, and to ensure that the shape is retained since there is high fitting requirement, matching points like cut marks and notch marks are usually marked for placing bottom elastic to the bra area, in the side seams and also in the lower scoop where elastic needs to be attached. The other important factor is fitting of the garment, in T-shirt if little more fabric than the required is cut, it doesn’t affect the shape much, but in case of swimwear it’s not acceptable. Even though sewing, pattern makings and fitting have similar structure for both garments but the performance based swimwear requires more strength and durability while leisure swimwear is more or less like a casual wear. Care should be taken to use elastic with minimum and extended level of stretchability according to the design criteria. The two major challenges faced in India and Bangladesh for sewing swimwear has been fixing a salary because it takes more time to sew a swimwear than a usual casual T-shirt, besides fabric sourcing for swimwear also requires great deal of know-how, along with high costs of purchase. The motivation for transition from basic casuals to swimwear lies within and the regular buyer seeks innovation in terms of fabric to give orders. So if one starts developing the category, there are endless opportunities in India and Bangladesh because there is no competition. Needles and threads are two major consumables for stitching a swimwear. Prolonged use of the same needle, damages the fabric much faster in case of fabrics with high lycra content while threads not matching with the seam specifications in terms of the seam’s maximum extensibility reduce seam strength. Sewing threads made of filament yarns with good stretchability and soft texture, are recommended for swimwear. As for deciding the correct needle, testing of fabric with varying coatings and finishes is done to find the best fit, because when needles run continuously, lots of defects like holes happen, resulting in damage if not paid attention to at the right time. The correct industry SOP is to change a needle every 4 to 6 hours depending on the usage in different types of operations like in flatlock and overlock where the needle runs non-stop. It is advisable to collaborate with a needle supplier and send the fabric sample for testing along with photos of operation to be done on the fabric before production. The major best practices which have come up in case of swimwear is of clubbing 2-3 seams together by method of seam bonding to give a smooth finish and great durability, longevity and good quality to the swimwear. If someone wants to setup a new factory, investment should be mostly on tape feeding attachments and other metering devices which have a significant place in swimwear manufacturing. Other than those, same machines, as in sewing a T-shirt, can be used for the manufacture of leisure swimwear like overlock, flatlock and lockstitch machines. Although the sewing machines can be same but the spare parts like needle plates, needle, pressure foot, taping devices like puller for a light weight fabric are different. When sewing, needle plate and other parts needs to be adjusted with correct tension, finely and precisely so that there is no slippage or pull in garment which might cause puckering, de-shaping or one side pull of the highly elastic garment. There is an elastic attachment for ladies leg opening for which pullers are used along with flat lock machine, where after elastic attaching the garment is turned and put in the machine to give a round covering to the elastic. Talking about feeding mechanisms, top and bottom feeding is recommended for places where 2 or more plies of fabric are used, which gives better, smooth finish to the seam because of uniform feeding of both fabric and elastic. In case of presser foot, Teflon coated presser foot is advisable along with differential feed dog. When machines are set for manufacturing a particular it is necessary that right seam type is swimwear, identified – whether to use lockstitch which has no stretchability or flatlock with higher stretchability in combination of threads having high stretchability to give durability and strength to the swimwear. In respect of front and back attaching seam, it’s the same as in T-shirt that is 3 or 4 thread overlock machines. The only variation is in the case of swimwear where one uses overlock in the side seam; here one needs to do top stitch also to give finished ends. In place of this, flatlock can be done with specialized machines. In case of overlock and top stitch, same sewing machine can be used as in other knit apparels. Having SAM values of 70% higher as compared to regular knits, swimwear requires more operators to get an output similar to that of knits, mostly due to the complexity in handling high lycra content fabrics. Therefore, for reducing the style changeover time and learning curve when converting a T-shirt line to swimwear, it’s always advisable to do a pilot production run, a week before with similar fabrics and quality parameters. To train a skilled operator who had been previously handling single jersey and pique requires just two days for learning to handle the fabric efficiently, since those operators are already skilled on flatlocking curves like armhole. But the learning curve would be much higher in case a shirt operator is given the job of stitching a swimwear. Since fabric is very stretchable there are certain precautions to be undertaken by sewing operators like taking care of matching points and not stretching the fabric too much. Fixing salary for completing X pieces is advisable rather than having operators work on piece rate basis to deliver right quality. The ratio of direct to indirect labour is usually 1:0.5 for giving high quality swimwear. A typical swimwear may have 22 operations with total SAM value of approximately 12 min. and usually 80 pieces can be produced in an hour with minimum 26 operators and 22 machines in total. There can be different kinds of production systems to be followed with manufacturing swimwear but it’s advisable to start up with progressive bundling system in combination of hourly auditing and then move on to Traffic Light System followed by Statistical process control. Depending on the success of Progressive Bundling System, it can be switched over to Modular Manufacturing System in some years. Modular Manufacturing is advisable for the companies already running progressive Bundling System over years and who want to cut down on manpower with rising costs of labour.